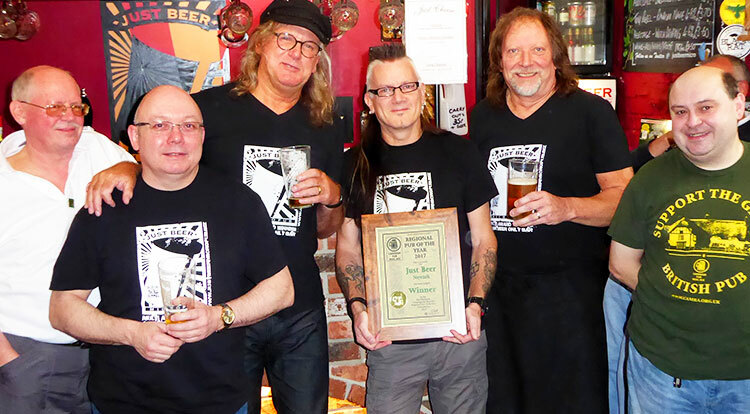 Just Beer was yesterday (28th October) awarded the accolade of Regional Pub of the Year in the CAMRA National Pub of the Year competition. This is the second time in seven years we have won the title and it’s even more amazing this time! We beat around 3,000 other pubs in the East Midlands area to take the award and it puts us in the last 16 running for the top prize of National Pub of the Year. The next round whittles the contenders down to four, before deciding on the National winner. The win was announced by Newark CAMRA chair, Andrew Birkhead, and the certificate handed over by Regional co-ordinator Carl Brett. Also in attendance was Nottinghamshire POTY co-ordinator Alan Ward. A great afternoon of celebrations followed with plenty of beer and free nosh, courtesy of Suzanne Neil. Of course, Just Beer wouldn’t exist but for its customers and huge thanks go out to every one of you for your continued custom.